If you’ve been scouring the Internet for all things to do with luxury vinyl flooring, you’re probably already up on the variety of effects available, stone, wood and even fabric. Then there are different colours and tones, each of which can help you select flooring that speaks to your style and fits with the particular requirements of your space. But does it still feel like something is missing? Are you looking for that extra flourish or finishing touch that takes your flooring from stylish to uniquely you? Design flooring is all about creating flooring that matches the character of a room, home or person. That’s where design strips, borders and features can make all the difference. Luxury vinyl flooring suppliers, such as Karndean or Amtico can give you a range of options to choose from, which in some cases also include bespoke designs. When it comes to strips, there are several options to explore. For a contemporary look, you can go with metallic strips for use in a border or around a feature. To create a natural effect you can select a feature strip made from plastic, which has been coloured to different shades of grouting. Or, pick from a wide range of design strips cut from other luxury vinyl tiles or planks. As for borders, there too lies an opportunity to make your flooring stand out from the crowd with decorative, tramline or keyline borders. Decorative borders are patterned to complement your flooring; blocks, weaves, chequered, zigzags, diamonds, the list of patterns goes on. Tramline borders are a more affordable way to add interest to the edging of your flooring, using a combination of different strips. 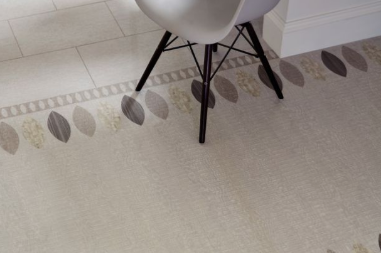 Finally, keyline borders use a single strip running along the edge of your flooring to subtly define the space; they can be used in combination with metallic or design strips. To make a bolder statement than a border or strip, opt for a design feature. This helps create a focal point in a room, such as the entrance hall or living room. 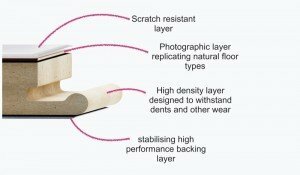 Karndean offers a range of standard designs, usually sized to 3 feet in width. You can add a personal touch by selecting the background colour and scaling up or down the sizing. However for the ultimate in customisation, you can opt for a bespoke design, simply sketch it out and take it into your local retailer. 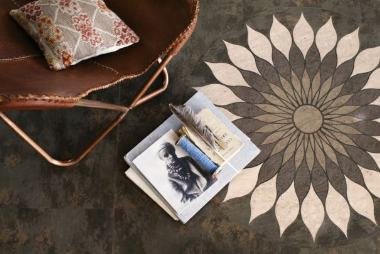 With these added accents to your design flooring, you can turn your floor from a functional essential to an eye-catching feature. Get started with your designs by selecting from Amtico’s range of luxury vinyl or Karndean’s Palio Clic, Korlok and LooseLay. Which luxury vinyl flooring is right for you?